I’m sure any woman reading this has already done the math. What wife would stick around these guys? Synetic Theater’s Taming of the Shrew opened with a graveside funeral, the mourners in raincoats and holding umbrellas, their backs to us. One by one they paid their respects to the man and two women in the middle. These turned out to be Baptista and his two daughters, Bianca and Katherina, and it is his wife, their mother, they are burying. The elder daughter, Kate, appeared to take the loss of her mother particularly hard, and director Paata Tsikurishvilli intimates this fed her shrewish behavior. In fact, many of Shakespeare’s plays have notable mothers missing—and one silent mother intriguingly present. Some plays do have mothers in key roles, even iconic ones. But when I started mulling over the state of motherhood in the full scope of his works, I realized that the absence of mothers could almost be connected into a thematic thread across the canon. I promise not to get Freudian here. First, doing so assumes Shakespeare’s plays are somehow biographical, and as I’ve discussed often on this website, such an assumption would be carelessness. Second, Freud himself placed Shakespeare on his couch and concluded that the man was not in fact Shakespeare but likely the Earl of Oxford, one of many reasons I’d gladly replace the “e” in the psychiatrist’s name with “a” when discussing his theories. If anything, Shakespeare is tapping into a greater psyche than his own, a cultural one that concerns not just the impact of motherhood, but parenthood. Consider these plays, in addition to The Taming of the Shrew and King Lear, featuring filial relationships at the center of the plot in which the mother is notably absent. As You Like It has five, count ’em, five offspring (Rosalind, Celia, and the three de Boys brothers), all with fathers playing key roles either in the play or before the play, but not a single mother. The Two Gentlemen of Verona has two fathers, one for Proteus, one for Sylvia, and no mothers. A Midsummer Night’s Dream has Egeus, father to Hermia, but no mother to Hermia. Desdemona has upset her father by eloping with Othello, but no mother is around to weigh in on her actions. Titus Andronicus had 25 sons and a daughter; they had no mothers that anyone speaks of. The Henry IV plays center on father-son relationships with no mothers factoring in. Historically, Prince Hal’s mother died when he was only 8 years old, so her absence in Henry IV has that excuse; yet, the plays leave out Henry IV’s second wife, Hal’s stepmother, too. Besides, Shakespeare so often blurred historical lines in his portrayals that he could have portrayed Joan of Navarre as Hal’s real mother if he wanted to, just as he made the Duchess of York Aumerle’s mother in Richard II rather than the stepmother she really was. Then there is Much Ado About Nothing. Leonato’s wife, and presumably Hero’s mother, Innogen, appears in the first scene. She says nothing and never appears again. The prevailing theory is that Shakespeare planned to use her but dropped her as he wrote the play and forgot to scratch out her name in the opening stage direction. 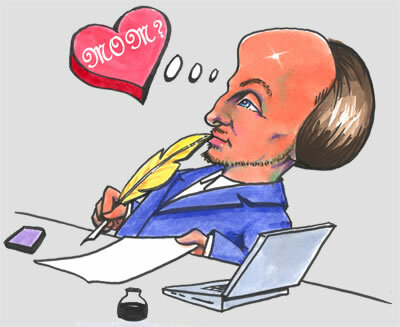 Shakespeare was careless at times, but that theory assumes that his original text was used for the Folio instead of a playhouse version. Sure, I may be overthinking this. After all, how different am I from the snob in front of me at a production of King Lear who, during the intermission, pontificated on why Cordelia didn’t just play along with her father’s “who loves me most” game, to which I felt like leaning in and saying, “If she did that, we’d have no play.” Shakespeare had no mothers in these plays because he didn’t need them. Simple answer. Or, just as likely, because he wrote plays with his company in mind, he chose not to occupy one of his actors with a mother’s role. Nevertheless, those would have been plot decisions rather than available-talent decisions. For every notably absent mother in his plays, Shakespeare created a famous mother in other plays: Margaret in Henry VI, Tamora in Titus Andronicus, Hermione in A Winter’s Tale, Ladies Capulet and Montague in Romeo and Juliet, Gertrude in Hamlet (though Laertes’ and Ophelia’s mother is missing), Mistress Page in The Merry Wives of Windsor, Emelia in The Comedy of Errors, two Duchesses of York (in the two Richards), Elizabeth in Richard III, Constance in King John, the Countess in All’s Well that Ends Well, and Virgilia and the mother of all mothers, Volumnia, in Coriolanus. Even Cleopatra is a mother (though her children remain off stage). The example of All’s Well that Ends Well might be most telling, for, while it does have a mother in the Countess and one for Diana, another mother is missing, Helen’s. Her father had recently died, but no mention is made of her mother. Meanwhile, her love interest, Bertram, has his mother, the Countess, but his father also has died before the play’s start. So, off he goes to the King of France’s court and then he goes off the rails when that king commands him to marry Helen after she’s cured the king of a deadly disease (hmmm, no queen in those scenes). Then she goes off after Bertram even after he publically despises her. You could argue that missing one or the other parent somehow messes up the constitution in these characters, and the same happens with other similarly situated characters across the canon. Interestingly, while the plays lacking a mother have a strong father, many of those with a strong mother either lack a father or that father is Henry VI (which is pretty much the same thing as lacking a father) or a ghost that may or may not be the devil. Traditional two-parent families appear in The Merry Wives and Romeo and Juliet, and however dysfunctional you may consider the Capulets, that play’s tragic plot comes about because the children make choices counter to their parents’ wishes. Traditional family units also appear in Comedy of Errors, Pericles, and The Winter’s Tale, and all of those have plots driven by the temporary loss of one or both parents. The gals can claim that Baptista, Lear, et al., got in their fixes for the lack of a mother’s influence. The guys can claim that Coriolanus, Hamlet, et al., got in their fixes because they were mama’s boys. Both arguments win. In Shakespeare’s world, strong family units equated with equilibrium in the social order. How interesting that the loss of that particular equilibrium is at least a backdrop for so many of his plays.